Another post for Top eBay Chess Items by Price, another Morphy item. It's only been a few weeks since we had Morphy Stereoview (July 2016), and now we have the item pictured below. 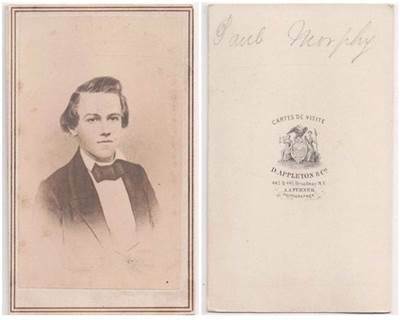 Titled 'Vintage CDV Paul Charles Morphy American chess player photo by Appelton', it had a starting price of US $19.99 and finally sold for $519.00 after 12 bids from five bidders. The item's description carried no more information other than a copy of Wikipedia's Morphy page. Those three letters are an acronym for the French carte de visite or visiting card. This style of antique photography took over in popularity from the daguerreotype or ambrotype of the 1840s and 1850s. Though they provided lovely images, the dag and ambro were easily damaged and not suitable to tuck into an album or a letter to a friend. The Civil War era of the 1860s, however, saw a wide acceptance of the cdv, the invention of either Adolph Disderi in 1854 or Louis Dodero in 1851. The cdv photograph belongs to the group known as card photographs because the albumen print (a mixture of egg whites, sodium chloride, and silver nitrate) was mounted on paper cards. The size of a cdv is 2 1/4" x 4 1/4". 443 & 445 Broadway N.Y. Follow-up: Brady CDVs (September 2016).